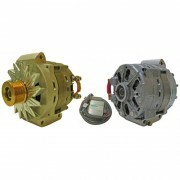 Penntex manufactures a number of different alternators for heavy-duty use, to fulfill a number of uses. 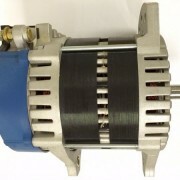 These heavy-duty Penntex replacement alternators are useful, as they are interchangeable between industries. For example, a 200 amp Penntex PX-520TD-6 can be used in school buses, fire engines, ambulances, and shuttle buses. Overall, this appears to be a useful and reliable alternator. However, heavy duty alternators have are capable of producing a high output – but by sacrificing low RPM as well. These alternators have a tendency to run at a very high RPM, putting unnecessary load and strain on the engine. An alternator in a heavy duty vehicle must be able to satisfy a substantial electrical load because of how often and how long these vehicles sit at idle. When you think of a school bus, fire engine, or ambulance, these vehicles sit for large blocks of time, using features such as lights, wheelchair lifts, ladders, and other components. When a regular car sits at idle, a little bit of high RPM isn’t much of a concern, because a passenger car or truck doesn’t need a substantial electrical load during these relatively short periods of time. A regular heavy duty alternator causes high RPM at idle, putting unnecessary wear and tear on the engine, the battery, and the alternator itself. It also is terrible on a vehicle’s fuel economy. When compared to other brands such as Penntex replacement alternators, a 260 amp Eco-Tech alternator functions well at 1,800 RPM, while its competitors are at 2,000 RPM, and in some cases, higher. A greener choice for the environment, the installation of an Eco-Tech alternator over a similar brand reduces 50 percent of engine drag. Fuel savings are substantial, as an Eco-Tech choice eliminates high fuel consumption at idle. A smarter choice overall, the Eco-Tech choice allows you to save on fuel, wear and tear, and replacement of components, while being kind to the environment.